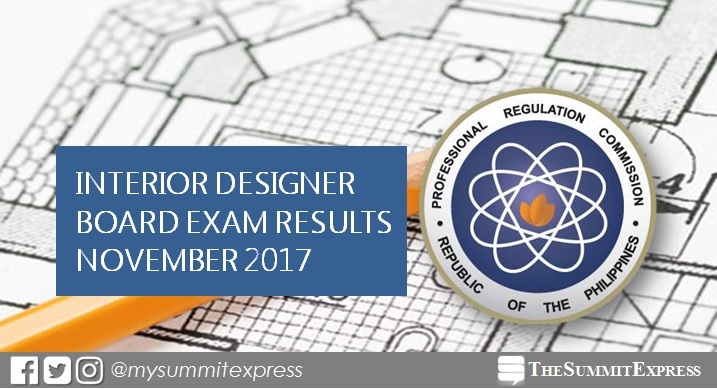 MANILA, Philippines - The November 2017 Interior Designer board exam results including the official list of passers, topnotchers (top 10), top performing schools and performance of schools were released on Friday, November 24, 2017 or in eight (8) working days after the last day of examinations. UPDATE: As announced, 113 out of 473 passed the exams. The Professional Regulation Commission (PRC) conducted the Interior Designer licensure exam in Manila on November 7, 8 and 9, 2017. Interior Designer board exam's verification of ratings (passers, non-passers and removal) can be done online. The three-day examination covered the following major subjects: interior design, furniture design and construction, materials of design and decoration, history of arts and interior design, interior construction and utilities, color theory and professional practice and ethics. According to PRC Resolution No. 2016-1019, the target release of results for the recent Interior Designer board exam is on Friday, November 17. However, due to the cancellation of government work in Metro Manila on November 13 to 15 in line with the Philippine hosting of the 31st ASEAN Summit, results are expected to be released on Monday to Wednesday, November 20-22 or in 4 to 6 working days after the exams. In the same period last year, results were released online in eight (8) working days. 213 out of 419 passed the Interior Designer Licensure examinations. Irene Kathleen Dee Dee from the Philippine School of Interior Design topped the board with 88.65%. University of the Philippines (UP) - Diliman was hailed as the top performing school with 95.35% passing rate (41 out of 43). Meanwhile, the November 2015 exam results were announced in ten (10) working days. 204 out of 336 passed the exams. UPD also topped the schools with its graduate Nasstasha Cara Mansilla Figueras got the highest place, 86.35%. Monitor this page for the real-time updates on Interior Designer board exam results. Check out also the official website of PRC for more information.